She found that—counter to conventional wisdom—people could collaborate to use and manage natural resources, intellectual property, and other shared resources. Her work runs counter to current ideas about common property management, regulation, and privatization. The concept of the commons is founded upon principles including collaborative and participatory governance, responsibility to prevent harm and repair damage, creation of a sense of shared ownership and belonging, enhanced relationships built upon deep connections to one another and the earth, and stewardship that creates sustainability for coming generations. 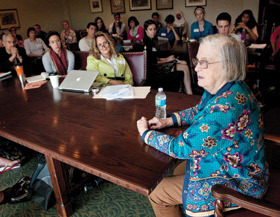 Learn more about Ostrom’s ideas and theories in this YouTube video. What is the commons? Read more here. The Festival of the Commons is a joint project of the Augsburg College Center for Citizenship and Learning, the Center for Democracy and Citizenship, and On the Commons. For more information, contact Elaine Eschenbacher at eschenba@augsburg.edu.